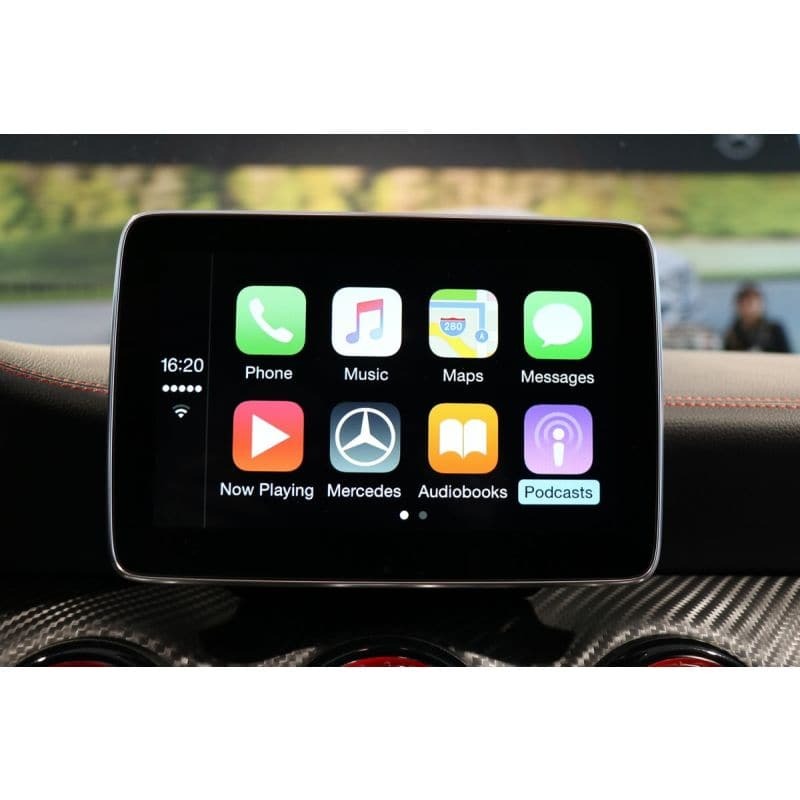 We now have stock of a unique new device that will allow owners of all A class, B class, CLA class and GLA class Mercedes to use Apple CarPlay on their existing radio and screen. By simply plugging this device into the OBD socket (located just above the brake pedal) and waiting less than two minutes, Android Auto and Apple CarPlay will be activated. As well as other lesser used features. I notice C class is not on the list. Are you likely to introduce a car play adaptor for this model? We are currently working on this but have no delivery dates set yet. It’s a hardware problem that we are trying to fix with software!! Has there been any progress with the C Class? I have just got a 2017 C Class and have already started to pull my hair out with the garmin satnav. I need to start using Waze again and don’t really want a mount in my car. We are currently looking at sourcing an affordable ‘Black Box’ option for CarPlay in C class (and other Mercedes) and are hopefully quite close. We will post our options onto the website as soon as they are available and will also let you know personally. Our current option is £600 fitted and we would need the car in our workshop for 3-4 hours to enable the. Class. Could you please also keep me posted when the box is ready? We have several options for C class now in stock. If you can send your chassis number (or reg no) to info@brayrooks.co.uk then we can look up which one will suit your car. Any updates on the Mercedes C-Class release? We have a solution for all C class models from 2012 now. If you can send your chassis number (or reg no) to info@braybrooks.co.uk I can check what will best suit your car. Hi Nicolas. This device will not work in your car as Premium Plus has full Comand and that is not have the hardware for in-built CarPlay (even on brand new cars!). We do however have a CarPlay SmartBox due into stock w/c 13th August which will offer CarPlay in your car. Details will be listed on our website very shortly. The cost of this module is £199. This includes FREE postage and packing in the UK. We usually carry these in stock and can dispatch within 24 hours. I have a w212 64reg E class saloon with the ntg 4.7 (i think) it comes with bluetooth but no car play, will this work on my vehicle? E class 212 does not have support for CarPlay so this option will not work. We are looking to import a CarPlay SmartBox which will add this feature to your car. The cost of this would be around £600 fitted. 2018 cars will have newer hardware which will then adopt this feature. GLC does not have support for CarPlay so this option will not work. We are looking to import a CarPlay SmartBox which will add this feature to your car. The cost of this would be around £600 fitted. 2018 cars will have newer hardware which will then adopt this feature. Does it work with GLC ? We have a device due in shortly that will work with late 2017 onward GLC and C class. Sadly it will not work with earlier cars. We are also looking at a solution for earlier cars that is a black box system that connects behind the radio but we are still trying to ascertain how integrated it actually is! This option will work out at a fitted price of somewhere around £600. (Installation is quite involved). If this is of interest please let me know and I can keep in touch as we progress. Have purchased a C Class registered March 2017. Would this device work with this car and when will it be available? Please can you keep me informed. I would be interested in android auto for a 2014 Comand NTG 5.2 C Class. Do you have the devices for the late C-Class yet? Mines a 67 plate, registered 2 weeks ago. Will this work on a 65 plate Mercedes B Class? If I purchase and it doesn’t work, can i return the item for a full refund? Sadly this device will not work on earlier cars. Sorry. We are looking for alternative ways of offering CarPlay to these cars and will post our findings on the website as soon as we have an affordable solution. I’m afraid this won’t work on your car. We are sampling an installed black box device that should work but we will know more in about two weeks. 1. Would this work for a new merc GLC with command (as in the premium plus upgrade) and the adaptive cruise pack? 2. Does it affect the warranty? 3. Any update on timings? We have a device on its way that may work. If you can email me your chassis number (or reg no if in UK) I can check your spec and see if it will work. This is a plug in adapter. We are also sampling an installed black box adapter that will work on any car and will have more news on that in about two weeks. Our simple device will not work on a car with Comand, so we currently have no solution. We are however working on a device that will work but have not completed testing yet. We should hopefully have news in the coming weeks. If you would like me to inform you when we get more information please let me know. We are testing new product this week that may also be compatible with S class. If it works OK and we import more modules I would be happy to try one in your S class on the understanding that it may not work (in which case we would make no charge). I am fairly confident however that the S class Comand system is similar enough to the C class for which this module is designed. Sorry. This will not work on E class. We have new products coming up so please keep an eye on the website or I can add you to our list to keep you updated with progress. Any update yet re: CarPlay addition to GLC pre 2018? Apologies. It has taken a lot longer to adapt to the uk market than we had hoped. We are still actively working on a solution and should have news in a few weeks. Thanks – there are a lot of people who would benefit from this! Hello. I’m very interested in upgrading my 2017 C Class with Apple CarPlay. Is the upgrade you spoke about available yet? would this work on a 2017 slc 250d? its audio 20 with garmin maps on sd card. it has the 2x usb ports but merc says they cant activate android auto as I don’t have a smart phone integration pack. I’m guessing the smart phone integration pack is android auto. We are currently testing this on another SLC and are awaiting results of a software update that is being carried out by Mercedes. We should have more information next week as the car is booked in for next Monday. does this also unlock android auto on a 2016 A class amg line?? This device will unlock the Android Auto function but the cars that it will work on are fairly limited! If you can forward me your reg no or chassis no I can check it out for you. We are currently looking for cars to test product on. We need a C class or GLC class that we can fit a CarPlay SmartBox to for testing and evaluation. If you would like to have this fitted we can offer this at a reduced price of £299 Inc VAT (RRP £600)with a full refund policy if you are not happy with it. We will only charge if our installation is successful but there is a possibility of compatibility issues which may need further investigation before we can achieve a successful outcome. Is there a option for a CLA shooting brake 2015? There are several options available depending on the spec of your car. If you can forward me your chassis number (or reg no) to neil@braybrooks.co.uk and I will check it out for you. This will probably work. If you can send me your chassis number I can check 100%. Hi, Will that work with Mercedes-benz B180 Sport Cdi Blue-cy Auto 15 Reg. It is possible this may work but it depends on your spec. If you can send your chassis number (or reg no) to info@braybrooks.co.uk then we can check specifically. I have a 2017 Mercedes C Class Coupe. Will this work for this model? We have finally had a successful test of the CarPlay SmartBox into a Mercedes C class with Garmin Sat Nav. The product worked really well with a good clear display operating in exactly the same manner as the factory fitted CarPlay. The one difference is in the Audio. Whilst using CarPlay as your Audio source the Apple Maps navigation will interrupt with it direction messages. If however you are listening to anything else on the car system (e.g. Radio, CD, Memory card etc) then the Audio will not be interrupted by the Apple Maps direction messages. Pricing is still to be finalised and stock should be available in 2-3 weeks. Hi do you have a price yet for the c class retrofit? Also will this work with android auto too? If you can send me your Chassis number I can let you know the options. We do have a device that will give Android Auto but it has limitations as to which vehicles. I have a facelift A Class from December 2015 and I believe it has Audio 20 as the interface. Would this or any other options be possible to enable CarPlay? We have two options for CarPlay in the A class and one of them WILL work. If you can send me your chassis number (or reg no) to info@braybrooks.co.uk then we can check which options will work. Your car is suitable for our device to activate CarPlay. However, before it can be used the car stereo needs to be updated to run the latest firmware (OS) by Mercedes. If your car is under warranty Mercedes will do this free of charge. Once this is done our device simply plugs in, transfers its information and is then removed. If your car has recently had any audio related complaints or map updates it is possible that this update has already been carried out. If you wanted to purchase a device to try, if it works straight away – Happy Days!! If it doesn’t work, then the update will need to be done and then the device re-inserted and then it will work. Warranty is not affected as the device does not remain in the vehicle. If you want to undo the modification, then re-inserting the device again will turn off CarPlay. Each insertion will toggle between On and Off. The device can be used as many times as you like but is locked specifically to your car upon initial insertion. If you wish to purchase, please either call the office or complete an order on our website and we will send you a Paypal invoice. I hope this helps and look forward to hearing from you soon. I have a 2017 SLC Garmin Sat Nav And the 20 Audio. Hi Paul. This device will not work on your vehicle unfortunately. We have a product launching very soon that will enable CarPlay on many other cars but it is not as yet tested on SLC. Once over the initial stock order/supply we will start testing other vehicles. Please keep an eye on the website for updates. I’m just about to order a c class 2018 Amg line with audio 20, will this work on it? Hi. It is most likely this will work. Please forward your chassis number to info@braybrooks.co.uk then we can confirm 100%. Stock of the product is due W/C 13th August. HI I have a 2018 glc 250d with garmin nav and sd card slot in the centre armrest storage, would my car be suitable for an upgrade? Hi , I’ve got a 62 plate (13) A250 AMG line I think it has NTG 4.7 , will this work to get Android Auto ? This module in NOT suitable for your car but we have another option that will work. Are you able to offer a Carplay conversion for a 2018 Mercedes Benz GLC AMG Line Coupe with standard fit Garmin Navigation. I’m hesitating over the purchase of this vehicle due to the lack of Comand option. It is most likely that this car can be updated to have CarPlay. (Comand still does not have the option- although we have another solution!). If you can send the reg number or chassis number to info@braybrooks.co.uk we can check to be 100%. Hi, I have c200d Sport registered in March 2018, does your adapter enable Android Auto On this model? 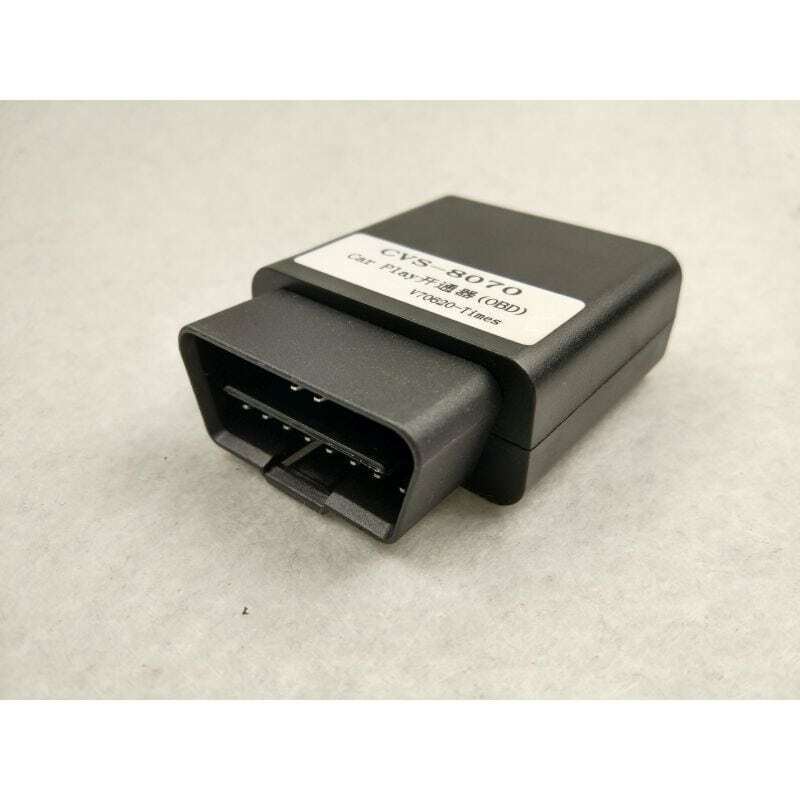 Our OBD adapter will work if your car has Audio 20 with Garmin Sat Nav. If it has Comand it will need our SmartBox solution. If you can send your VIN number (or reg no) to info@braybrooks.co.uk we can check and be 100%. Tengo un clase C W205 del año 2018 con Comand NTG 5.2, referencia SA531. ¿teneis algo disponible para actualizar por OBD?. No tenemos nada que le otorgue a CarPlay OBD, pero tiene una SmartBox que funcionará. El costo es de £ 480 y demora alrededor de una hora en instalarse. Hi, just got hold of a 2015 B class with the SD card slot for Nav instead of the glove box Becker I was expecting, also the USB ports, one has the image of a phone and screen behind it, am I correct in thinking you device will be compatible? I have S213 E-class estate AMG Line registered in April 2018. It has NTG5.5 with Garmin SatNav. Will your OBD solution be available to activate Apple Carplay on this model? We currently do not have a solution for new E class to activate CarPlay. We are actively working on a solution and will post information on our website as soon as we have a solution. i have a C63S convertible Vin No WDD2054872F732757 – It’s a 2018 model registered 6th April 2018. What options do i have for apple car play and costings please. I hope this is of interest and look forward to hearing from you soon. thankyou for getting back to me.Yes i am interested in this. Before i commit are you working on an OBD carpal upgrade or is this the only solution available.? If it’s done in your workshop is it something that can be done while i wait e.g. a couple of hours or is it a complete day?? The manufacturer of your unit is Melco rather than Panasonic so the hardware is not in place for us to be able to activate CarPlay. Installation of the SmartBox takes 1.5 to 2 hours so we are more than happy for you to wait whilst we install. Have you a unit to activate Apple Play on my 2016 GLC with Audio 20 Garmin Sat Nav. On this year of car, the manufacturer of the radio is Melco and they did not have the required hardware to enable CarPlay. Only in late 2017 they changed supplier to Panasonic which has the relevant abilities to activate CarPlay. This device won’t work on the V class but we may have other options. If you can send the VIN number (or reg no) to info@braybrooks.co.uk we can check out exactly what will work. Thanks. I have the correct labelled USB connection port with the phone/tablet symbol. I have just had the car into Mercedes and they have “done an update to the Audio 20”. Not sure what but I will find out and message you again. I have just ordered a new facelift (MY19) C200 with the standard, non command system. Will this activator work? It is very likely this will work on your new car. We can only be 100% when we have vehicle details. I believe however that CarPlay is now standard on 2019 C class although Mercedes do have a habit of changing the spec!! As soon as you can get a chassis number for the car we can check for you. Any news yet on whether you closer to having an OBD solution for a S213 E-class estate AMG Line registered in April 2018. It has NTG5.5 with Garmin SatNav. Does this work with the x-Class? We have not looked at possibilities for X class yet. If you can email me your chassis number (or reg no) we can look up what equipment Mercedes are using in this model and see what our options are. Many thanks. Please do let me know even if CarPlay is already fitted as we would like to know what Mercedes are doing on this model. I’ve looked at what equipment is fitted and can see that it is the same a C class, some of which have CarPlay active and some still don’t. Hi, can you please tell me the current options (if any) for my 2015 Mercedes C200 Sport. It’s the 2016 model. For the 2015/2016 C class the solution for CarPlay/Android Auto is to use our SmartBox device. I have a 2018 CLA with audio20, I have an SD slot but no sd card (no sat nav). Will this work on my car? As I bought one from another company and it didn’t work, it went into DIAG but then nothing..don’t want to end up getting it again if it doesn’t work.. It is most likely that our system will work but before we sell any of our products we would check first. Please send your chassis number (or reg no) to info@braybrooks.co.uk and we can check out your specific options. I have a 2016 e class with audio 20 it has an sd slot for nav, any chance it could work? It is quite likely this will work. If you can send your chassis number (or reg no) to info@braybrooks.co.uk we can check it out for you. I have questioned Mercedes Me connect as to how they can justify charging £267.00 to activate Apple CarPlay. They can’t really give me an answer. I have spoken to the developer & they insist this feature is free if your vehicle supports Apple CarPlay ( the new a class has it integrated) I can’t understand how they can charge this extortionate amount for something the car already has built in. Any comments appreciated ! If you are being offered a solution at £267 then I would say it is worth every penny as there is no other known solution at this time. We have exhausted every avenue to activate CarPlay on new A class and E classes but as of yet have been unable to find any solution. We are of course constantly seeking this product in the hope that we will eventually find a solution. As a price guide we are currently at £249 for C class & GLC. Does this work on a 2017 x class ? We have a solution for X class. If you can send me VIN number (or reg no) to info@braybrooks.co.uk, and we can let you know what option will work on your car. I have a Mercedes E-220D Coupe Registered September 2018 (68-REG – Newest Model). Do you have anything that can activate Apple Car Play for my car. I have the USB Port with the ‘Tablet Symbol’. I’m worried the answer may be a no at this moment in time, I hope I am wrong though. We are desperately seeking a solution for CarPlay in the new E class but as of yet we have not got the answers we are seeking. Hi, do you sell the Apple CarPlay activation tool for a 2018 Mercedes GLA ?? Hi James. If you can send me your chassis number (or reg no) to info@braybrooks.co.uk we can check your options for you. I have recently been told my (UK) 2018 CLA AMG line will not work with the activator, the vendor checked my VIN number. Could you check also and confirm it doesn’t work? And if you know of any reason why it wouldn’t work, that’ll help my peace of mind, as I thought it worked with all CLAs. We have had many successes recently with CLA so would be happy to supply a device that will activate CarPlay on your car. If you can give me your chassis number I can check to be 100%. Please send to info@braybrooks.co.uk. Hi I have 2016 E-class 220D , with garmin Map pilot with SD card . Will this devise work on it . We have no solution currently for new E class. We are desperately seeking a remedy and can let you know if we find something but as of yet we have nothing – sorry! does the list on a-class include 15 reg and below? On the new E class it doesn’t come as standard but we are unable to offer a solution on those cars at the moment. We are desperately seeking a solution but as of yet we have not found one – sorry! Hi, I have a cla shooting brake 2016 plate with what I now believe to be the audio 20 system? I have asked at the dealer for the firmware upgrade but have been told they won’t do it. I have also read that the system needs the USB connection with the mirror or phone symbol by it on the glovebox which mine doesn’t have (I have 2 USB ports numbered 1 and 2) I have the Garmin sat nav sad card. will your device activate my system for CarPlay? Are there any known failures? Apple CarPlay / Android Auto is available on your car but may require several processes. If your USB sockets in the Armrest are marked 1 & 2 then we will need to replace this part for one that is Marked with a ‘Telephone’ logo and a ‘USB’ logo. If your car already has this then this section can be skipped. Hi, I have a 67 plate c class coupe (reg DO06 MCC), garmin SD card maps, can CarPlay be activated? It is a very simple installation that takes just a few minutes. Just had a new 19 plate Xclass V6 Power dropped to us and did not realise it would be without CarPlay, we have the Command system in place. Is it possible to add it on at this point? Any help would be greatly appreciated as can’t find much on this topic for this model! We do however have a solution that will give you CarPlay in your car. Click here to view on our website. Would this work on the Aston Martin DBS Superleggera as it uses the last generation system? The system in the Aston does use the same equipment and a colleague of mine is in the process of testing at the moment. As soon as I get the results of this test I will let you know. Hi Neil, I have just got model 2019 e class 220 d, 19 plate with audio 20 with wide screen without premium pack and not able to activate android Auto nor car play. Do you have any solution for this? I’m 99% that we can now do this. This does however involve connecting our diagnostic computer to your car. The cost is £150 + VAT and takes approx one hour. Hi could you tell me if I can get an adapter for CarPlay for a Mercedes a class 2015 sport cdi ? Many thanks for all your useful information. Android Auto worked perfectly on my Mercedes GLC250D (2018 model) from May 2018 until last week when I left it in for the recent official Mercedes recall (passenger seat airbag sensor malfunction). The dealer refuses to fix it. Have you come across this problem – it has happened to one other GLC owner that I know of. Many thanks, John. Mercedes have really done the dirty on us! The supposed Airbag recall includes reprogramming the radio which wipes out CarPlay. This is total BS because the Airbag system is protected against all the other aspects of the car but they are telling people that because it is a safety recall that the warranty is invalid if not performed!